Here is a more "Christmas-y" entry in my Gotham Garden seasonal series. I used the same technique from Sleepwalker Wood to create the lights in the foreground. 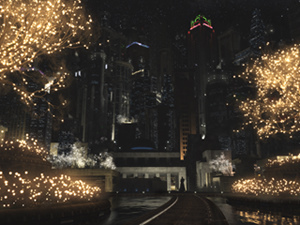 The lights on the far rooftop gardens are actually texturemaped onto the trees themselves. Vue doesn't let you put ecosystems on ecosystem objects (yet) but I think this was a nice workaround. Every Gotham entry is my favorite! I love to set up my desktop to change to each one throughout the day. I especially love the light in this edition, and I love the untold stories of the brooding solitary knight. "GothamGardenxmasblue1 wrong one .. 1680 x 1050"
I am getting the standard yellow light on the trees when I try for the 1680 x 1050 of the blue light Gotham garden Xmas. Is it possible to fix this I love it! "Gotham Garden Blue Christmas 5760x1080"
I asked Santa if he would bring me a no-snow version of the Gotham Garden Blue Christmas, triple monitor, 5760x1080. Regardless, the Gotham Garden collection is my absolute favorite. Goththam Garden Christmas - WOW! Your Gotham series is my favorite. I love your newest addition to it. I apologize for not updating my screen. I didn't see that it took. Where is the love for a triple screen blue gotham garden xmas? Awwww, no love for a 5760x 1080 Blue Christmas?? Sweet! Thanks Ryan you rock! I may need to get a new FTP program. The 3840 x 1200 should be listed now. Am I missing some resolutions or is this still being rendered? You mentioned Vue keeps backups, but you might want to try a semi-Real Time backup like Genie Timeline. Totally agree losing saved work is a huge pain, but software that backs up files as they change might be something to consider and could make saving more frequently less of a problem. "Blue light Gotham , no snow triple?" I love the Gotham renders! Gotham Garden (Autumn) was what sold me on buying a membership. That and the fact that you have the best triple screen wallpapers! 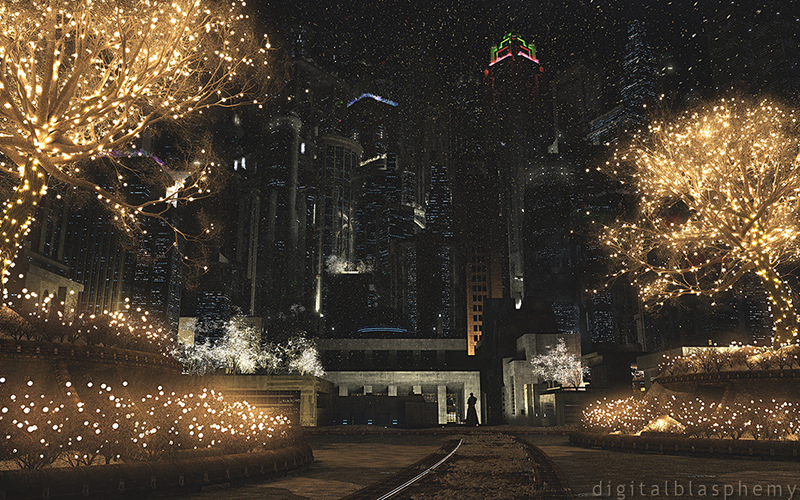 Any chance the Blue light Gotham Christmas with no snow will become a triple monitor render as well??? Santa? I really like the blue lights but the falling snow still doesn't look right. Can we have a blue version without it? "Great Wallpaper, but where are the clouds?" Thanks for another Gotham City. The 1680x1050 link under gothamgardenxmasblue1 links to a wrong pickle jar version. Keep up the great work. Am I the only one who wonders why that guy has been standing in Gotham Garden for over a year now? I like the addition of the snow and ice. The ice adds some realism. All versions have been great, but #3 tops the list for me. I've added a third render this morning. I've changed the falling snow back to my 2D "fake" flakes and I've added snow/ice in the foreground. Beautiful, I love that you brought back a classic. Would it be possible to get a 3840x1080 version as well, for my dual-screen setup. Thanks Ryan! Have you looked into using something like Subversion? A document revision/version control application? I'm a software engineer, and that's the application I use to control the source code for several of my critical projects, though subversion doesn't care what kind of files it is maintaining the version history for. It can be code, office documents, whatever. The only question I would have, is how subversion would scale to accommodate your graphics source files, which I imagine are quite large. In any case. I hope you get all that sorted out. It's got to be frustrating having your software eat your stuff. Really really nice! Keep up the great work Ryan. I agree that this was a good candidate for arboreal illumination, and the second version does make for a good early December wallpaper (especially here in New York, where there's barely any snow right now, but people are already starting to decorate things with lights). Nice seasonal update. I Put it in my Windows wallpaper rotation. This is such a beautiful image! I really love it. I, personally, prefer the first image with the snow, but with just a bit less on the right side, to be similar to the left. Beautiful, Ryan! What is this wallpaper without the snow? Not nearly wintery or Christmasy enough. Vue saves a set number of backup files every time you save. I sometimes have to go back 2 or 3 in order to get a file that I can open, but I have made so many changes that it is rather discouraging to have to redo so much. If I save more often then I run the risk that all my backups could be corrupted. @Ryan. Regarding the file loss you've been experiencing... Do you retain backup copies of your critical data? That way, if your application eats your current working copy of a project, you can revert back to the last known good copy in your backup. can you color some of the lights??? and you know you've got mr trained when the first thing I did was look for the Gardener!!! Would be even more awesome without the snow/grain? 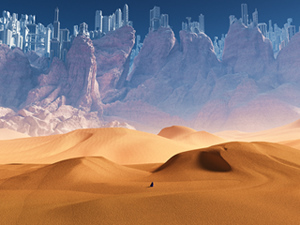 Lacks the surreal crispness I've come to the love about the wallpapers. If it weren't for that, this would be a definite 10. As it is, I'd put it about 5-8. "9.0 but could be 10.0"
My comment is the same as others who asked about the snow effect. I downloaded this and set it as my background and immediately thought something was wrong with the picture because of the pricks of light. It appeared more on the right side and actually made the picture look "dirty". 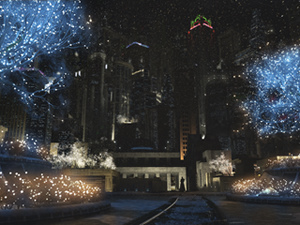 There must be another way to make this picture look more "Christmasy", such as adding snow to the walkways, etc. But the fine snow pricks of light detract from the beautiful image. Then I read the other comments and knew I was not alone in this thought. I LOVE Gotham Garden, so this is GREAT to see. It would be a 10 for me except for the snow. Two things: FIRST, you already have stars at the top and a vast array of building lights below that, so adding another layer of objects that size might not be a good idea anyway. For me, this picture is quite successful. I really like the cold, snowy, alone-in-the-big-city at night, reflections-in-the-water, atmosphere of it. I actually think the snow came out better here than it did in, say, Sleepwalker Woods Winter with its motion blurred stuff close to the viewer. The odd thing is that the snow looks (HD monitor) like a "curtain" of snow at the level of the figure and anything closer to the viewer is just plain grainier. The snow would actually look great if there was some context. Needs a bit of snow on the ground or or on the garden edges. woohoo, the "gotham" series is the one that finishes up on my desktop most often. Now I have the Xmas version. Will leave the technical comments to those who know what they are talking about (I certainly don't - I am here for the pretty pictures :). I really like the Gotham Garden series and it's cool to see a holiday version. I agree with other folks about the noisy snow being an issue. Other than that I like it - the depth of interest with the decorations on far buildings is nice. Although the theme is a favorite of mine, the speckles detract much. Also, for the taller-than-wide compositions used for mobile devices, something right-of-center that brings in the tree covered with lights would be welcome—even if it meant losing the tall building with the blue lights. I tried out Vue's new particle snow here and the results, as some have notices, are a bit noisy. I may try it without snowfall and see how that looks. I think some different colored lights and more snow would do well, and I agree; a bit too grainy. Otherwise well done. "I give this an 8"
Why are so many of the recent pictures all speckly?